1Universidade Estadual do Norte Fluminense Darcy Ribeiro, CEP: 28013-602, Campos dos Goytacazes, Rio de Janeiro, Brasil. 2Empresa Brasileira de Pesquisa Agropecuária, Centro Nacional de Pesquisa de Gado de Leite, CEP: 36038-330, Juiz de Fora, Minas Gerais, Brasil. 3Universidade Federal Rural do Rio de Janeiro, CEP: 23897-000, Seropédica, Rio de Janeiro, Brasil. 4Universidade Federal de Juiz de Fora, CEP: 36036-330, Juiz de Fora, Minas Gerais, Brasil. The efficient use of fodder and grassland as the basis of animal feed represents a way of raising productivity and reducing production costs. In this scenario, elephant-grass stands out among the most used forages in the intensive animal production systems in the world mainly due to its high productive potential, support capacity and nutritional quality. The purpose of this work was to estimate genetic parameters for the selection of elephant-grass (Pennisetum purpureum Schumach.) clones for forage production in two seasons, a period of water restriction and the total period of study. We evaluated 80 accessions of elephant-grass by means of the mixed-models methodology (REML/BLUP). The evaluation of DM yield (DMY) of the different genotypes were executed in edaphoclimatic conditions in Campos dos Goytacazes, Rio de Janeiro, Brazil. The Selegen-REML/BLUP software accomplished the statistical and genetic analyses. It was seen that the DMY trait was with a low estimate of coefficient of genotypic variation (3.08%), which demonstrates possible difficulties with the selection for this trait. Heritability-coefficient estimate was 0.3606 for the dry season and 0.4193 for the total period. Those results were the variation in that trait due to genetic causes. Although those values may not be considered of high magnitude, they are of great interest for the breeding mainly because it is a polygenic trait. In both periods, genotypes 7, 25, 41, 43, 57, 58, 62, 64, 68, and 77 stood out among the others, since it presented the highest genetic gains for DMY, which will enhance progress in the evaluated trait. The efficient use of forage and pasture for animal feed is a way to increase productivity, such as the increase in milk and meat production (Pereira et al., 2001), and to reduce production costs. In this case, the forage is an excellent alternative to minimize the scarcity of forage during the most critical season of the year, that is, the dry season. The elephant-grass (Pennisetum purpureum Schumach.) has been pointed as one of the main species applied to that purpose (Daher et al., 2004) and can be considered as productive forage. The cultivation of elephant-grass is widely disseminated in Brazil, since it is one of the species which presents more photosynthetic efficiency, high genetic variability and ability of adapting to various climatic conditions (Valle et al., 2009). Today, one of the greatest breeding research challenges is the selection of genotypes that are more adapted to each climatic condition in Brazil and those ones that perform better response along the season when demand is at its highest, that is, in the dry season. It is of major importance, during the process of selection, to quantify the magnitude of the genetic variances in relation to the environmental ones due to the environment, in order to provide information related to the type of gene that acts on the trait heritability (Vencovsky and Barriga, 1992). Thus, the use of mixed-models of restricted maximum likelihood/best linear unbiased prediction (REML/BLUP) type is essential for higher efficiency in identifying progenies or rows with greater genotypic merit (Resende, 2007; Ramalho and Araújo, 2011). That methodology enables the data correction for environmental effects; estimation of genetic parameters; prediction of genetic values; comparison between time and plot; and maximization of the selective accuracy, genetic gain; and selection efficiency of the breeding programs (Viana and Resende, 2014). The definition of some parameters, such as genotypic variance and heritability, is of great interest and essential to define the best strategy of selection and to design the breeding program. The use of mixed-models of REML/BLUP type has been successfully applied in the improvement of different crops, such as Glycine max, Solanum tuberosum, Sorghum bicolor, Coffea arabica, Cojfea canephora, Brachiaria humidicola, Panicum maximum, Saccharum officinarum, Passiflora spp., among others (Figueiredo et al., 2012; Braz et al., 2013; Pinheiro et al., 2013; Almeida Filho et al., 2014; Salgado et al., 2014; Miranda et al., 2015; Santos et al., 2015; Carias et al., 2016; Braz et al., 2017; Da Silva et al., 2017). On the other side, there are a few works using the REML/BLUP method in the elephant-grass crop. Therefore, the objective of this work was to estimate the genetic parameter to select elephant-grass genotypes for forage production by means of the evaluation of the DM yield according to the mixed-model methodology (REML/BLUP), an innovative proposal to improve the crop aiming to succeed in the selective process for potential genotypes for forage production. The experiment was performed in the agreement area between the State Center for Research on Agroenergy and Waste Use of PESAGRO, Rio de Janeiro State, and Universidade Estadual do Norte Fluminense Darcy Ribeiro (UENF), located in Campos dos Goytacazes (21°19'23" S, 41°19'40" W), Rio de Janeiro State, in an arrea with smooth topography, in an Argisol, dystrophic soil. According to Kóppen's (1948) climate classification, the predominant climate in the North of Rio de Janeiro State is Aw: Hot tropical, humid climate, with dry season during the winter and rainy in the summer. The planting was made on 23-24 February 2011, using whole stems, distributed in pairs in the furrows placed with the base of a plant touching the apex of another plant. In the fertilization on planting, 60 g P2O5 (single superphosphate) was given for each row; it was made topdressing fertilization 50 d after planting and also immediately after the harvests, applying 70 g urea and 40 g KCl per row, corresponding to 28.6 kg N ha-1 and 24 kg K2O ha-1. After the establishment phase, all the genotypes were cut at ground level (uniformity cut) on 15 March 2012 and then topdressing fertilization was carried out with 70 g urea and 40 g KCl per row. In the plots with failures in plant emergence, replanting was performed. 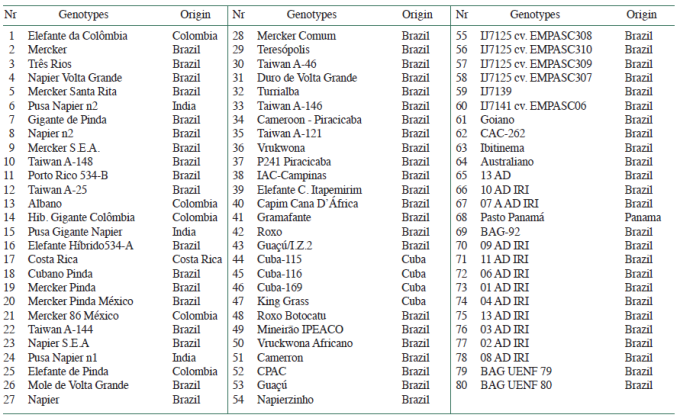 The 80 accessions of elephant-grass presented in the Active Germplasm Bank at State Universidade Estadual do Norte Fluminense Darcy Ribeiro, from Embrapa Gado de Leite (Coronel Pacheco, Minas Gerais) (Table 1), were assessed in randomized block design with two replicates, and the plot constituted by one 5.5-m row spaced 2 m apart, totaling 11 m2. Evaluations were made considering the development/production of the crop throughout water restriction (dry season) and throughout the total period of the experiment analysis. The investigation during the dry season was defined by two harvests determined to 12 and 24 wk after uniformity (4 June 2012 and 27 August 2012, respectively). Three harvests were carried out during the water season (26 October 2012, 5 March 2013, and 8 May 2013) at 32.51 and 60 wk after uniformity, respectively. The development/production of the genotypes over the total period of analysis was defined by means of those five harvests. Table 1 Identification of the elephant-grass accessions of the Active Germplasm Bank. The rainfall during the experiment was obtained by means of data collection from the evapotranspirometric station of UENF/PESAGRO (Table 2). To accomplish the DM yield (DMY) variance (t ha-1), the weighing of plants of the useful plot area was performed. A sample was taken and packed in a paper bag, weighed and placed in a drying oven at 65 °C for 72 h. Subsequently, samples were weighted again to determine the air-dried sample (ADS). After that, they were ground in a 1-mm sieve and kept in a drying oven at 105 °C for 12 h to determine the drying oven-dried sample (DDS). The percentage of DM was obtained and estimated the production of DM by means of the ADS and DDS values. It was possible to determine the total DMY applying the data of DMY during dry and rainy seasons. 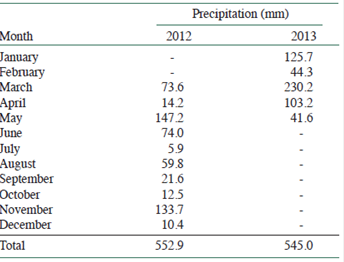 Table 2 Rainfall during the experiments of elephant-grass (March 2012-May 2013). Campos dos Goytacazes, Rio de Janeiro State. where y is the vector of known observed data; r is the vector of replicate effects (assumed fixed) added to the overall mean; g is the vector of genotypic effects (assumed random); e is the vector of errors or residues (random); and X and Z represent the incidence matrices for the effects described. The means of the individual plots of each genotype obtained from the two replicates were used to perform the analyses. The following variance components (individual REML) were estimated: Genotypic variance (Vg); environmental variance (Ve); individual phenotypic variance (Vf); h2mc: heritability of the genotypic mean, assuming no loss of plots; selective accuracy of the clones (Acclones); coefficient of genetic variation (CVg); coefficient of experimental variation (CVe); and coefficient of relative variation (CVr). Estimates of genetic parameters related to the DMY during the dry season (dry-DMY) and to the total DMY (total-DMY) are given in Table 3. The determination of estimate of genotypic variance (Vg) is a quantity that allows us to recognize the genetic variability found in a population, enabling us to infer changes that may be achieved by means of a selection in a breeding program. According to Pinto et al. (2013), when the variance estimate is represented by positive and non-zero values, there is considerable variability among the genotypes analyzed, able to be applied for selection purposes. The estimates of genotypic variance obtained for the DMY trait were positive and different from zero in both periods, respectively, 3.08 and 9.64. This way, the DMY variance, besides presenting great economic importance in the crop, can be used for an effective selection among genotypes, especially when a less restrictive period (drought + water) is taken into consideration. The estimates of the heritability coefficient were of 0.3603 (dry-DMY) and 0.4193 (total-DMY), considered medium magnitude (0.15 < h < 0.50), according to Resende (2007). Those results evidence that 36.03% and 41.93% of variation in the trait are due to genetic causes. Therefore, it can be stated that the environmental factor has a considerable influence on that variable. That fact can be evidenced by the high values of residual variation attained for the DMY trait in both periods (10.93 and 26.72). On the other hand, those results establish a good genetic control and a suitable potential for selection within species especially since the DMY is a polygenic trait. Daher et al. (2004) presented a similar result; they reached an h2 value of 33% considering the DMY of forage. In contrast, Emerenciano Neto et al. (2015) observed estimates of high magnitude heritability in hybrids of elephant-grass for the DM content trait, with a mean of 75.95% between harvests. As stated by the authors, that result referred to the environmental control performed by the implementation of irrigation and also by the low variation of temperature throughout the experiment. Table 3 Estimate of genetic parameters for dry matter yield (DMY). CVr: CVg/CVe = coefficient of relative variation. The CVgi ratios ranged from 12.98% to 16.08% for the total period and the dry season, respectively. Those results can be considered of high magnitude in order to reassure the existence of genetic variability among the accessions and to predict greater selections according to the trait under study. In order to define the best strategy in breeding, the prevalence of the environmental variation over the genetic one, that is, the coefficient of relative variance (CVr), which quantifies the predominance of the environmental variance over the genetic one, has to be taken into account. The coefficient of relative variance (CVr), similar to the magnitude of the ratio between the CVgi and the CVe, presented values of 0.53 and 0.60, respectively, for the DMY trait. Values close to or higher than 1 represent a favorable situation to inferences with high accuracies and very high precisions for the selection of a specific trait. The conclusion about the values of CVr has to be analyzed together with the number of replicates, since that characteristic is directly related to the experimental accuracy. Thus, the values of the relative variation for the DMY trait found in this work led to intermediate heritability quotients, enabling an acceptable accuracy for that trait (Vencovsky, 1987). Resende and Duarte (2007) say that accuracy refers to the correlation between the true genotypic value of the genetic material and the one estimated from the information of the field experiments, informing the correct ordering of the genotypes for selection purposes, and also the effectiveness of the inference about the genotypic value. That is because it depends not only on the magnitude of the residual variation and number of replicates but also on the ratio between genetic and residual variations associated with the trait under evaluation. The estimates of selective accuracy for DMY trait ranged from 0.60 (dry) to 0.65 (total). Nevertheless, it can be increased using a more adequate experiment, keeping the same size of the experiment, but evaluating plants in an individual manner. 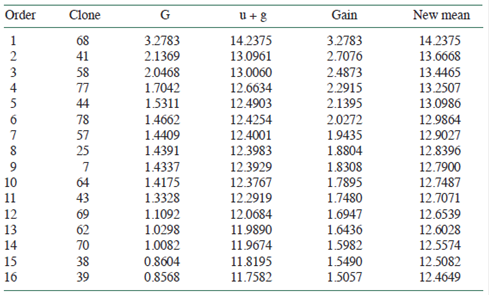 The relation of the progenies selected according to genetic effect, predicted genetic gain, and new means obtained for each of the variances evaluated in relation to the components of means is presented in Table 4. Among the 80 clones evaluated, 16 (20% of the total) best clones of elephant-grass were ranked, in order to identify the genotypes that evidenced a higher genetic gain taking into account the aim of this work. Resende (2007) says that the REML/BLUP methodology allows the ordering of possible genotypes for selection investigating all genotypic variation for each variable analyzed. Pinto et al. (2013) states that the genetic gain corresponds to the vector mean of the predicted genetic effects for the selected clones. For the DMY trait, the 16 best genotypes had gain variation between 7.66 and 2.78 t ha-1 and a mean gain of 4.83. The best genotype was 68, with 7.66, which led to a new mean of 31.58 t ha-1. The lowest value was of the genotype 7, presenting predicted gains around 2.78 t ha-1; it indicated that this genotype would not be advantageous to significant advances regarding the DMY during the analyzed period. Table 4 Ordering, predicted genotypic effect (G), genotypic mean (u+g), gain and new mean for DM yield, with a selection of 16 best clones for the DM yield variable related to the total period. Table 5 Ordering, predicted genotypic effect (G), genotypic mean (u+g), gain and new mean for DM yield, with a selection of 16 best clones for the DM yield variable related to the drought period. Considering the dry season, the best genotypes presented gain variation between 3.28 and 1.51 t ha-1 and a mean gain of 2.00 t ha-1 (Table 5). Genotype 68 was again higher than the other ones, with a predicted genotypic effect around 3.28 and a new mean around 14.24. 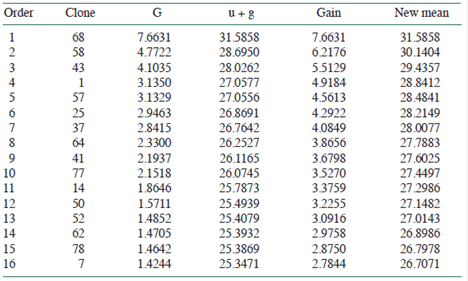 In contrast, genotype 39 presented the lowest gain with approximately 1.51 t ha-1 and a predicted genotypic effect of 0.86 (Table 5). Chiorato et al. (2008) assert that an efficient selection of genotypes should be based on both the variance components and on the mean ones, and that the genotypes of higher mean and genetic variability should be selected for a relevant genetic gain. Taking into consideration both periods of analyses, it can be stated that from the total of evaluated genotypes, 10 accessions were among the best genotypes. Thus, genotypes 7, 25, 41, 43, 57, 58, 62, 64, 68, and 77 showed high production throughout the period of water restriction as well as over the period consisted of dry and rainy months, classified according to their respective rainfalls. In light of the above, those genotypes present production stability to contribute to the Elephant-Grass Breeding Program and the progress in material selection aiming forage purposes. Therefore, the genetic diversity among the various accessions analyzed is of high magnitude for the DMY; it can be investigated by breeding programs applying evaluation and selection of superior materials in the places where they will be recommended, since its performance depends on the interaction between genotypes and environments (Silva et al., 2010). When considering the most critical season of the year, the dry season, the selection of productive genotypes is important for the viability of animal production, since those genotypes present an excellent option for reserve due to its high potential for production of good quality forage even in poor climate conditions. The genotypes discussed in this work have wide genetic variability in the evaluated trait. The selection should take into account the DM yield mostly because that variable presents economic significance for the crop. The value of the medium heritability of the genotypes for the DM yield trait allowed obtaining medium accuracies for selection among genotypes. The genotypes 7, 25, 41, 43, 57, 58, 62, 64, 68, and 77 stood out among the other ones because it presented great genetic gains for DM yield in both periods of analysis. Therefore, it will certainly contribute to higher advances in the selection.